Prices are provided below for delivery within the United States and also for international shipping. If you have questions or want to check availability of an item, contact Helen by email – – or by telephone – 901-355-5614. We keep a limited number of t-shirts on hand. If you want one, please contact Helen to check availability of your size. The prices immediately below include packing and shipping within the USA. 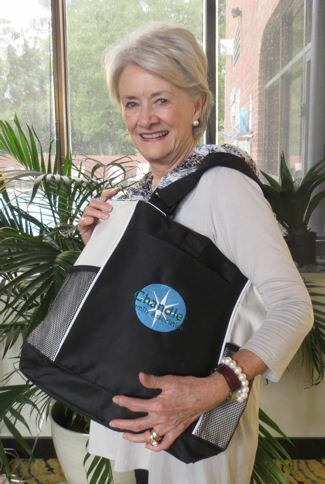 $15At right, Sue Davis of Australia models the new tote. It is a perfect size for either leisure travel or research trips. 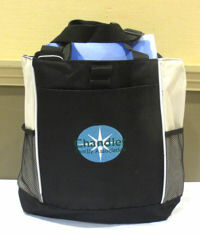 The tote colors are black and stone; the logo colors are sky blue, green and white. 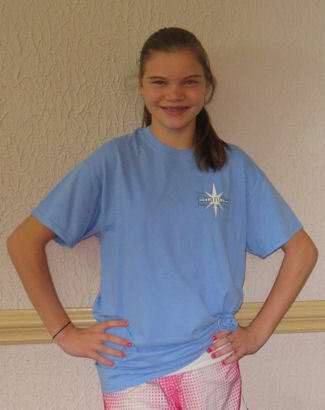 $10At right, a young Chandler descendant models our sky blue t-shirt with a modified two-color version of the CFA logo, Available in sizes M, L, XL and XXL.